Our goals are, first and foremost to provide you with a garden service second to none. We achieve this through a high level of knowledge and expertise, a positive attitude to work and creating a garden solution tailored to your individual needs. Our knowledge and expertise grows all the time, we are always willing to learn and make certain we listen to your ideas and suggestions. Our aim is to create a garden and landscapes that you will love and will grow with you. We have a wide variety of skills at your service and we pride ourselves on our workmanship at every level. All our work is completed to a very high standard, from the material we buy to the tools we use, we always use the best. 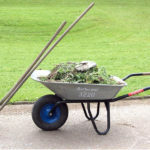 We mostly work in and around the M60 Manchester but we do have clients all the over the North-West, our garden maintenance services covers both North and South Manchester, as well as Trafford, Tameside and Stockport. We have 4 maintenance vans on the road at any one time, covering the whole of Greater Manchester, so if it’s a regular Garden maintenance service you’re looking for we will meet your needs. We also have a Landscaping team who operate in the same area. This team do driveways, patios, fencing, flagging, turfing, and planting. Here at Weed Warriors there many ways to pay, We are happy to accept, Barter, Cash, Bank Transfer and also Bitcoin.